Today North Korean media reports that Kim Jong-un visited the newly renovated Pyongyang Teacher Training College (평양교원대학). Despite the glowing description of this model school in the official KWP paper, the school’s history has been a textbook case of “Our-style economic mismanagement” [(CR) Curtis Melvin 2018]. However, as work to complete the exterior of the hotel picked up, the school was torn down. 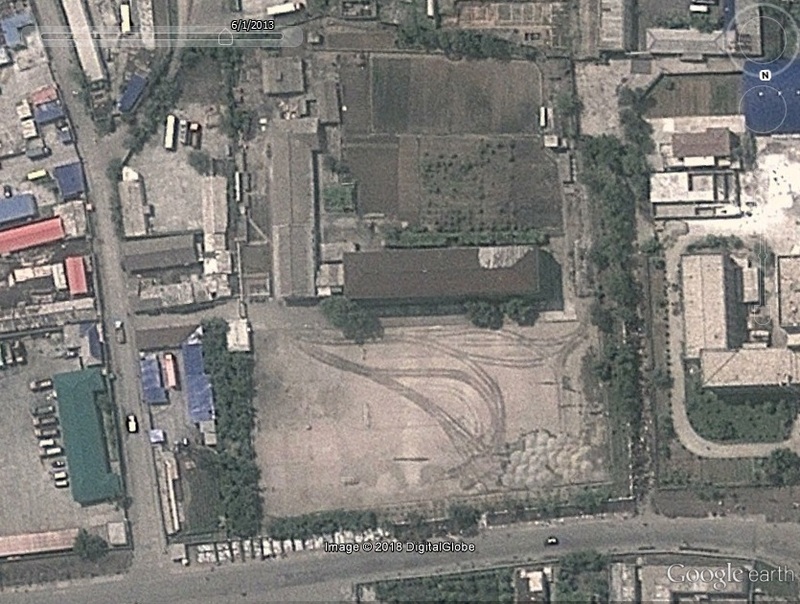 In the image below (dated April 10, 2011) the school has been completely removed. A new location for the school was selected in Mangyongdae District–the site of the old College of Mechanical Engineering. However it took nearly two years for renovation work to begin at the site (in May 2013). 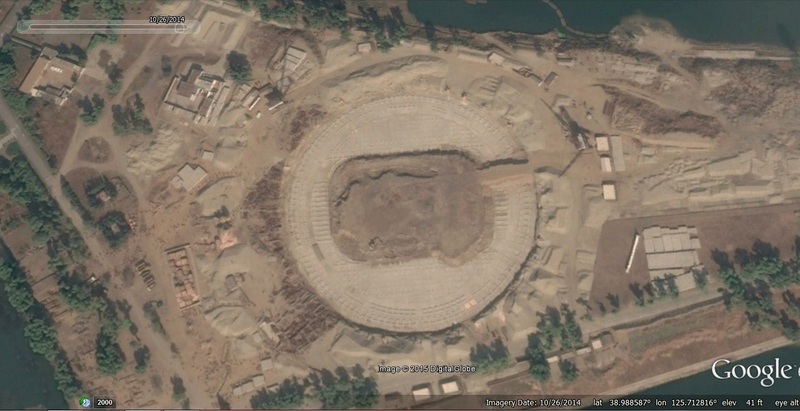 In the image below, dated June 1, 2013, you can see that renovation work has begun. 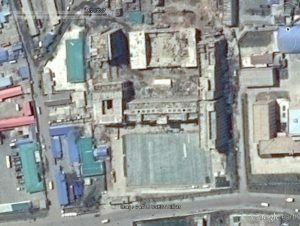 Renovation work on the Pyongyang Teacher Training College seems to have been completed by 2016, and it was featured on KCTV on December 20 (I could link to the actual video, but Google and Youtube have chosen to censor it). 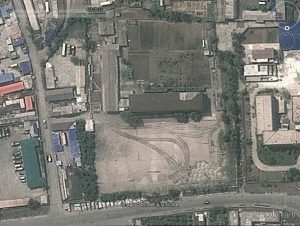 I am not sure where or if the Pyongyang Teacher Training College was operating between April 2011 (when the old campus was torn down) and December 2016 (when the new building was apparently opened). 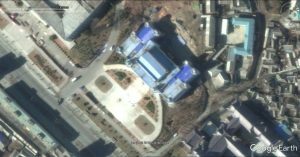 So Kim Jong-un’s visit in January 2018 indicates that the second round of renovations took just about a year to complete. 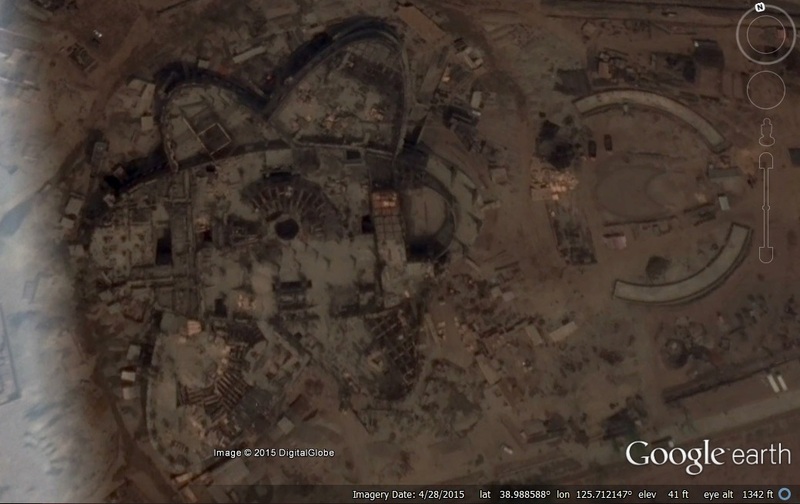 Below are images of both renovations placed next to each other. Unfortunately there are other examples of this type of economic mismanagement. North Korean universities have begun programs to train specialists in matters related to special economic zones (SEZs) and their development. 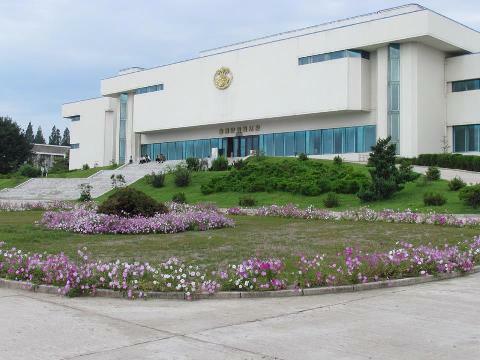 According to the website, the training of specialists in the development of SEZs has begun at Kim Il Sung University, the University of the People’s Economy, and Jong Jun Taek University of Economics (also known as Wonsan University of Economics). These universities have departments specializing in the management of SEZs, real estate, tourism, and international investment. The curricula are based upon the developmental experiences of Rason Economic Investment Zone, the Hwanggumpyong-Wihwado Economic Zones, along with the law, regulations, and the experience of other countries. These departments train specialists on the economic principles and effects of special economic development zones, theories on the form zones take and how development occurs, as well as how developmental strategy is devised. 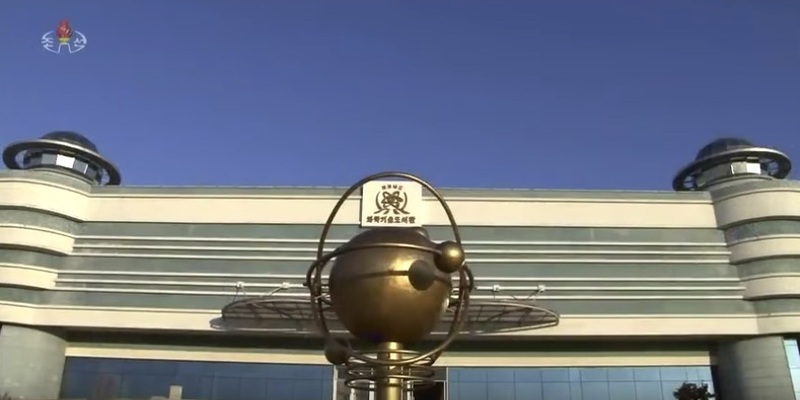 They also deal with issues like the creation of comprehensive development plans, the designation of companies for participation in development projects, the conclusion of development-related contracts, the conferring of development rights, the conclusion of land-usage contracts, the sale of land usage rights and the operation of sub-structural operations, and management of investment by foreign companies. 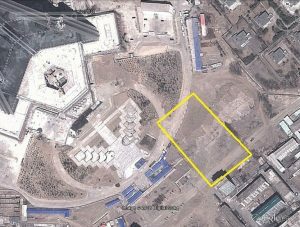 The North Korean magazine ‘Mount Kumgang’ — which targets a foreign audience — for the last two months has also printed a series entitled ‘Regarding plans to expand foreign investment relations’. The series publicizes the variety of government policies designed to attract investment. The Rason SEZ (Rason Economic and Trade Zone) was created in the 1990s. 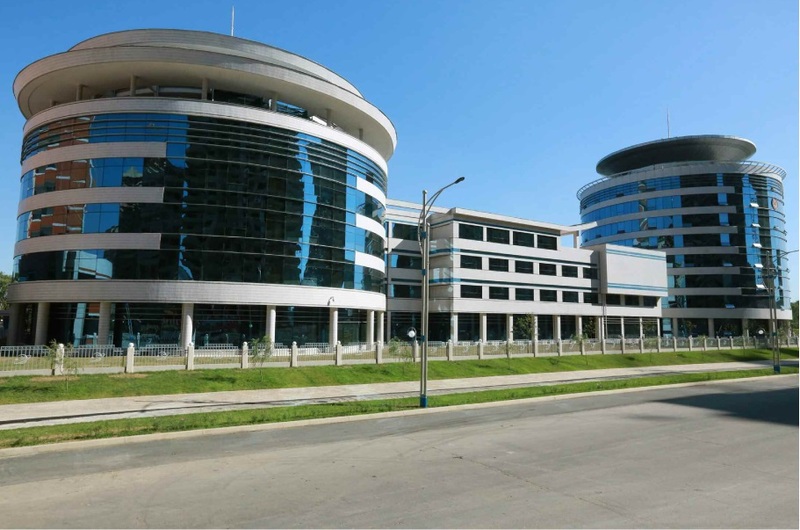 In 2013, SEZs were also announced in each of the country’s provinces. At present there are 26 SEZs in North Korea. 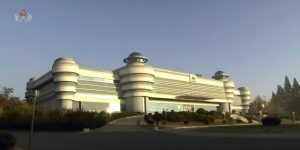 New economics university opens in Pyongyang. With online courses! While currently under the most stringent international sanctions imposed following its fourth nuclear test, North Korea opened a new university in Pyongyang focused on nurturing economic experts. 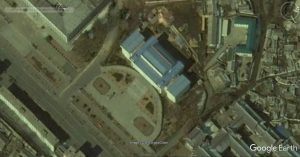 The Choson Sinbo, a pro-North Korean press in Japan, reported on April 28 that the new university held its opening ceremony on April 1, 2016. 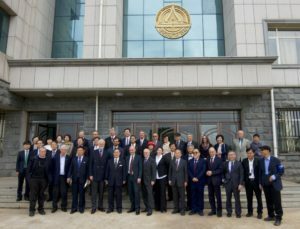 ‘Pyongyang Economy and Technology University’ (평양경제기술대학 Pyeongyanggyeongjegisuldaehak) is the new name of the already existing ‘Pyongyang Professional School of Statistics’ (Pyeongyangtonggyejeonmunhakgyo), an institution previously established for the same purpose. According to the news report, the institution established departments and classes accordingly as it aims to train experts on practical technology in economy for factories and companies. The curriculum is said to be practical, comprehensive, and modern, and to emphasize on-site education and research on the current economic situation. The news report also mentioned that the university has improved its educational conditions and environment, and that it has commenced initiatives to improve the quality of its staff as well as informatization of the practicum for its major subjects. The university offers a library for e-books and audio-visual classrooms for foreign languages, and it has informatized and databased teaching methods, administration for academic affairs, etc. Song Sam-Sung, the president of the institution, stated that the university plans to develop a new initiative to distribute e-teaching plans prepared by the university’s employees to professional technical universities throughout the country. The university first opened in October 1969 as a vocational high school and was developed to become ‘Pyongyang Professional School of Statistics’, which was equivalent to a technical college. It was restructured into a professional-technical university beginning last year. The original article from Choson Sinbo is available here, though you need to go through a very simple registration process to get login details. 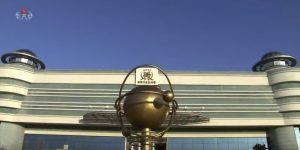 The website Tongil News also writes about the school here. 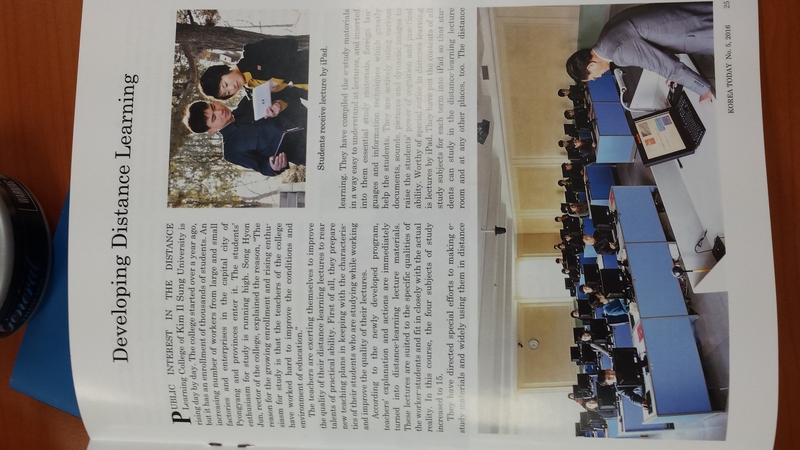 I found another article in Korea Today (no. 5, 2016) about online teaching in North Korea. This one is about online courses taught at Kim Il Sung University. Photo credits: Benjamin Katzeff Silberstein. The Higher Education Department has implemented a variety of changes to cultivate these skilled individuals. “We have organized college school systems, programs, and courses; offered new departments, including high-tech studies; and have worked meticulously to draw up a new education code,” Ho explained. In the process they have organized hundreds of departments at dozens of colleges across the country and created dozens of high-technology departments. 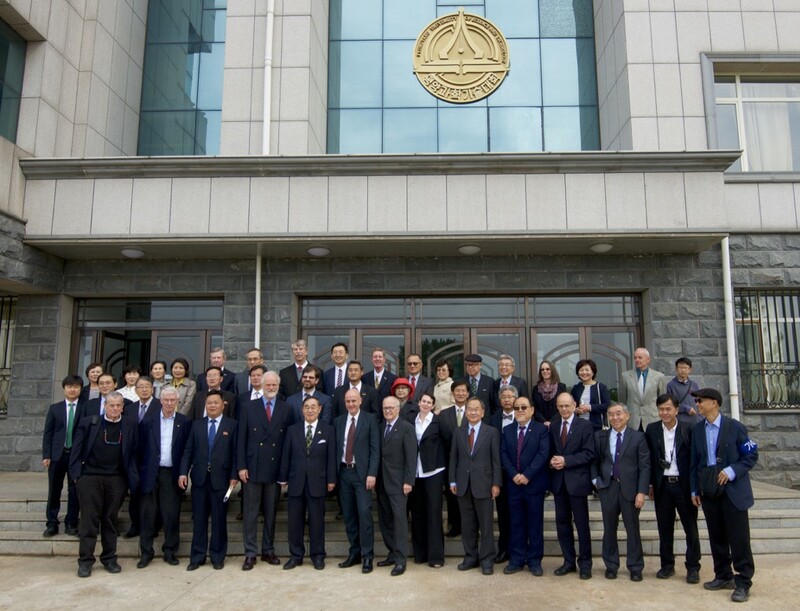 In some departments, such as those at Kim Il Sung University and Kim Chaek University of Technology, they have further developed higher education systems directly linking master’s and doctorate programs with regular programs. Ho added, “We have established regional universities in several provinces. We organized them by selecting one college well suited for the province as the parent school and integrating several colleges into that school.” He said that in North Hwanghae Province they established Hwangbuk University, while in North Pyongan Province they established Pyongbuk University. In a country with zero kindergartens specifically for the deaf, Robert Grund wants to help establish the first — just a small suite of rooms for perhaps a couple dozen kids, in North Korea’s capital, Pyongyang, a city of roughly 2.5 million. It’s a small step, but Grund, the Pyongyang representative of the World Federation of the Deaf and the city’s only full-time deaf foreign resident, sees it as part of a larger push to end isolation for the deaf here by helping them be heard, involved and empowered in projects about them. He appears to be making progress. Over the past few years, North Korean officials have grown more receptive to helping the disabled. Events have become more frequent and get a higher profile in the state-run media, while more cultural exchanges are being allowed abroad. Recent media stories played up a new all-deaf soccer team. The North last month held high-profile events to mark Disabled Persons Day. The kindergarten project is also coming together. Grund says officials have approved a location for the facility, several rooms in a now under-used nursery building, and appear keen on opening it in time for the 70th anniversary of the founding of the country’s ruling party on Oct. 10. 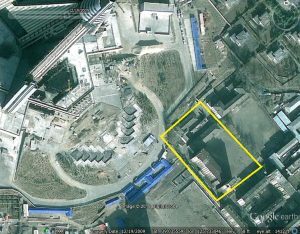 The kindergarten itself will be wholly paid for and funded by TOGETHER-Hamhung, a German non-profit Disabled Persons Organization. The plan is to accept children from infancy on up until they are old enough to attend regular deaf schools. Grund hopes access will be based solely on need, but he is not sure whether the government will instead decide who gets to go. To be deaf in North Korea is to endure a level of isolation that is hard to imagine. For most of his childhood, Ri Jong Hyok was a shut in. While his father went out to do construction work, he stayed at home in Pyongyang helping his mother make tofu. He didn’t go to school. He had no friends and, with no one to teach him sign language, essentially no way to communicate with them even if he did. “I had never seen sign language before I came here,” Ri told the AP through a sign language interpreter during a visit to the country’s largest school for the deaf, in Songchon, outside of Pyongyang, last year. Ri is lucky to have found the school. He wants to be a barber, and the school has a classroom where the students practice cutting each other’s hair, with barber’s chairs and pictures of various hairstyles on the walls. With few other trades open to the deaf, the most common jobs are barber or tailor for men, and hairstylist or seamstress for women. Of the eight schools for older deaf children in North Korea, none are located in Pyongyang, though statistically the deaf population in a city the same size in a developing country would likely be in the tens of thousands. There are roughly 300,000 deaf people in all of North Korea, according to official estimates. But while about 10-20 percent of deaf children in developing countries are able to study in deaf schools, according to the World Federation of the Deaf, that rate is just 2 percent in North Korea, said an aid worker who spoke on condition of anonymity because of worries that ongoing projects might be hurt. North Korean officials dispute that estimate. Ro Kyong Su, director of the Korean Economic and Cultural Center for the Deaf and Blind, said mainstream public schools or other special-needs facilities currently accommodate most deaf or hearing-impaired students. By his calculations, there are about 6,000 school-age deaf children who need to be in schools that are specifically for the deaf. He said about half already are, and the number is rising. “The other half will soon be able to go to school. We aren’t looking at a five-year or 10-year plan. It will be much sooner than that,” he said. Officials involved in projects for the deaf acknowledge an outdated grasp of the size of the deaf community. A major problem continues to be getting access to and diagnosing pre-school children, many of whom are shut in at home with families who have little awareness of hearing disabilities or the resources that might be available to them. The government’s figures are also based on an old, somewhat ambiguous survey. Underreporting of disabilities is common, both because of a sense of shame and a fear among parents that, if reported, their children might be sent off to distant institutions, pigeonholed and channeled into an educational or career path with few opportunities. Nevertheless, a new survey is underway, which Ro believes will provide a more reliable picture. Grund, possibly more than anyone else, has helped influence the change in attitudes toward the deaf here. As a teenager, he watched a TV report in his native Germany suggesting there were “practically no” deaf people in North Korea. A fourth-generation deaf child in his own family, an incredulous Grund decided to go see for himself. Grund, now 30, has since devoted himself to improving life for deaf North Koreans. He works with the bureaucracy and with the deaf to train them to plan and lead their own projects. Though funding is always a struggle, he has received support from Catholic and Protestant groups and private donors, mainly in Germany. The biggest individual contribution came from Michael Spavor, of Paektu Cultural Exchange and the organizer of former NBA star Dennis Rodman’s visit last year, who donated $20,000 to the deaf kindergarten project. 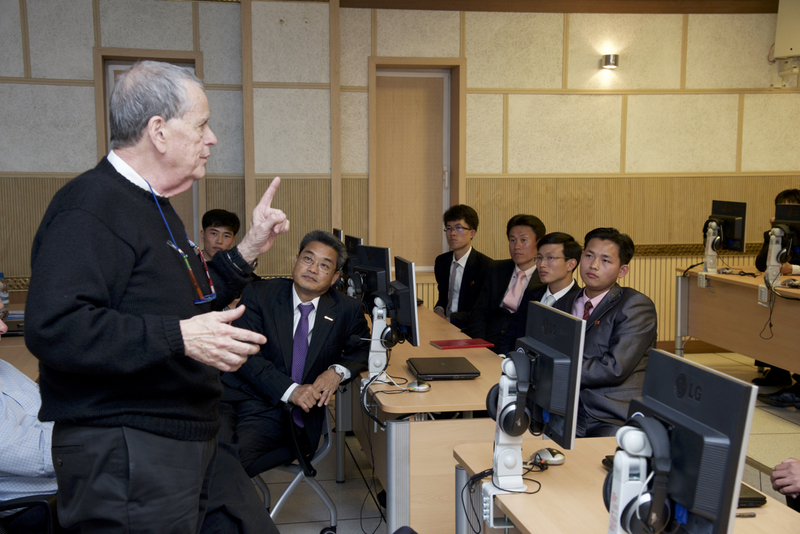 Grund’s mantra for empowering the deaf, “nothing about us without us,” often rankles with even the most sympathetic North Korean officials. In the country’s top-down system, hearing bureaucrats who often don’t understand the deaf experience are used to making decisions on their behalf. 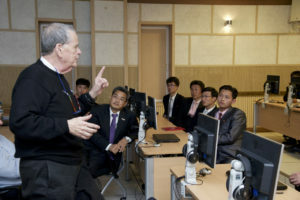 Grund says he will continue to cooperate with deaf North Koreans — he currently works closely with about 20, up from just two in 2013 — to help them join mainstream society. One priority is more schools for occupational training and educational opportunities for the deaf. Another is teaching more deaf children — and interpreters — how to sign. He also wants sign language interpretation made available at workplaces and meetings. But most of all, he wants to see signing on national television broadcasts, if just to raise awareness in the hearing community that the deaf exist and need not be hidden away. “That has been my oldest dream, from the time I first came here,” he said. 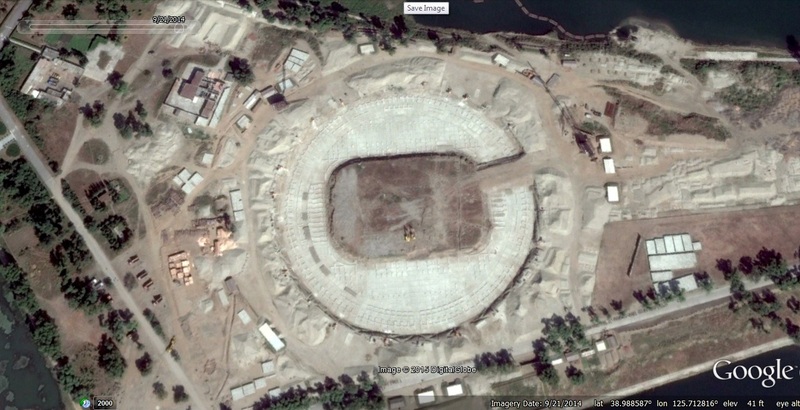 Pyongyang, August 12, 2015 17:23 KST (KCNA) — The Central Information Agency for Science and Technology in the DPRK has pushed ahead with the preparations for running the Sci-Tech Complex, which is now under construction in Pyongyang. The Agency concentrated its efforts on developing various kinds of service programs on a higher level. The programs include information retrieval system, database management system, print system and translation system. It is also conducting at the final stage the work to synthesize and systematize a large amount of data. Meanwhile, more than 1 000 multimedia pieces and scores of diagrams were produced. 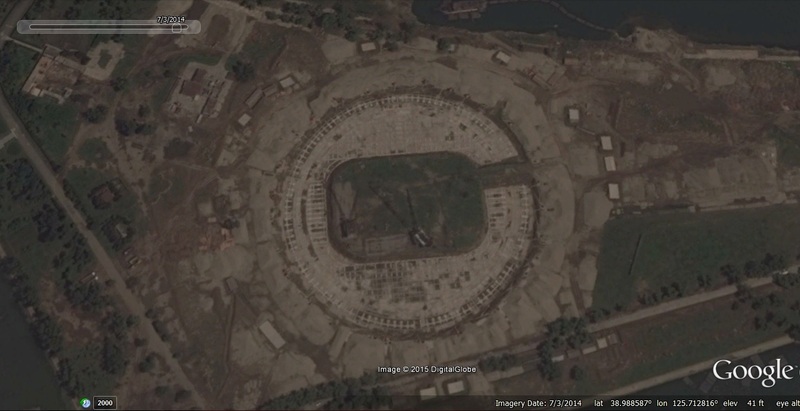 A sci-tech complex is being built on Ssuk Islet in the Taedong River meandering through the middle of Pyongyang. The complex is almost equal to the Grand People’s Study House in both total area and height. 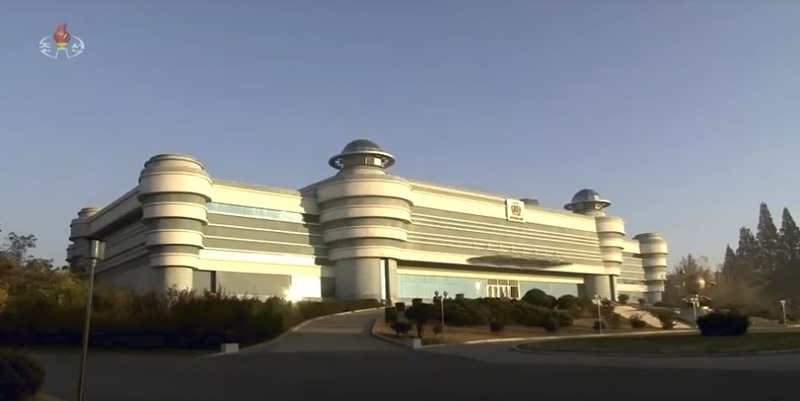 The Grand People’s Study House is a Korean-style building with an area of 100 000 square metres. 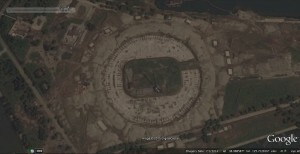 It was completed in 1982 in a year and nine months after its groundbreaking. It contributed greatly to making the whole society intellectual and developing the country’s science and technology. The new centre is a palace of learning for all people as well as scientists and technicians. It is intended for making all people well-versed in science and technology. It will also serve as a centre for disseminating cutting-edge science and tech-nology across the country. Latest architectural technologies are employed intensively to the construction. 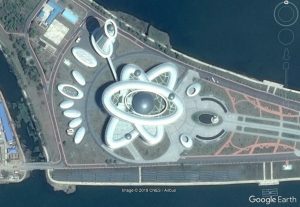 A green building, the exterior is designed in the form of a large atomic structure symbolic of the world of science to make viewers feel at a glance that it is an information centre of science and technology. 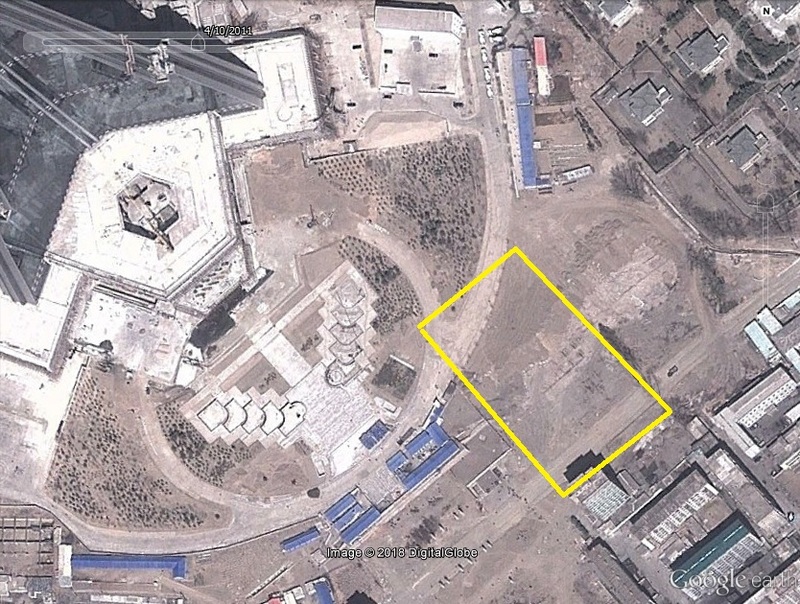 Several flower-patterned outdoor exhibition grounds, study places, a fountain park and a science and technology tower will be built around the main building. In the central hall that reaches up to the fourth floor will be installed a model of a carrier rocket of artificial earth satellite. On every floor will be arranged e-reading rooms for professionals, where they can have access to any information in various fields, as befits a general e-library. The layout includes sectoral sci-tech exhibition halls, online lecture room, room for the show of science film, local and foreign technological information exchange room for joint research and exchange and hall for presentations of scientific and technological achievements and workshops. Also arranged in the complex will be children’s dream hall for helping them acquire scientific principles and cultivate a web of fantasy, basic knowledge application hall for schoolchildren and halls showing the history of the development of science and technology in the country. It will be furnished with facilities to transmit information needed for sci-tech information rooms throughout the country. A several-kilometre-long embankment will be built around the island to prevent flood water. Road extending more than four kilometres will be laid in the compound and the bridge linking the island to Chungsong Bridge will be rebuilt into a new three-way bridge branching into the island. A trolley bus line is to be built, forming a loop line from Yokjon Street, via Mirae Scientists Street and Chungsong Bridge, to the island. Tens of thousands of tall trees and flowering shrubs are planned to be planted on the island to landscape the surroundings of the complex and new species of turf over a large area will add to the beautiful scenery of the island. 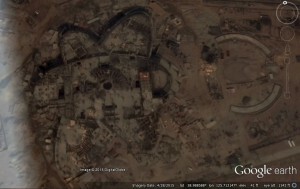 It is a gigantic construction project with a huge workload. Soldier builders engaged in the construction are now stepping up the project as scheduled to create a new Pyongyang spirit and Pyongyang speed in the “all-at-once” spirit of the Korean People’s Army of transforming mountains and rivers not in a decade but in a year. After finishing the excavation for the foundations, the most difficult task, in the biting cold of midwinter they are pushing ahead with the concrete work for the foundations underground and the first floor. The construction of a modern 500-capacity tower hotel, bridge leading to the island and the trolley bus line is being pushed in a three-dimensional way. The builders in charge of the bridge are pushing forward with the project as planned by applying advanced construction methods to the building of cofferdam and excavation for the foundations of piers. Civil servants cleared the site over several thousand square metres and planted over 3 000 trees and flowering shrubs in 15 species. 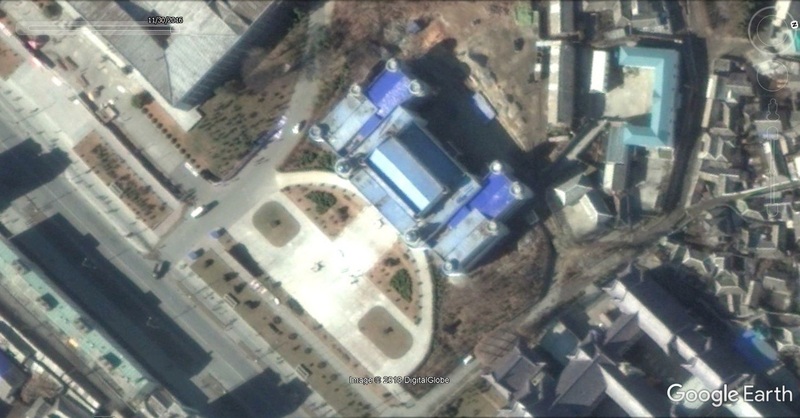 UPDATE 3 (2015-2-27): Kim Jong-un has made a second visit to Ssuk Islet to guide construction of the “Sci-Tech Complex”. 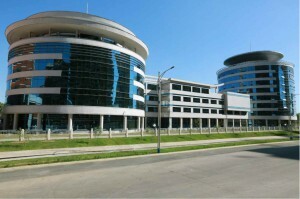 The complex should serve as a seat of learning where not only scientists and technicians but also people from all walks of life can have an ample opportunity of learning and a center for disseminating latest science and technology throughout the country, he said, calling for constructing it to be impeccable in terms of architectural beauty and practical use. 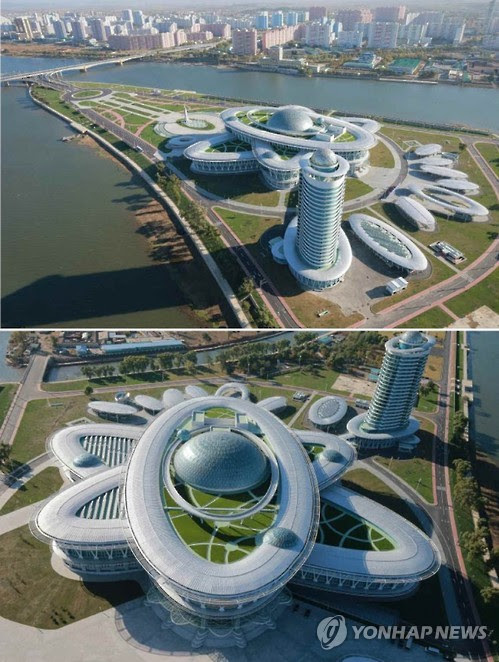 He gave an instruction to build a hotel capable of accommodating 500 people which can match well its surrounding environment so that it may provide best convenience to visitors. He called for pushing ahead with the construction of the complex and preparations for its operation simultaneously.He underscored the need to meticulously organize the work for building a strong latest science and technology database, supplying equipment and apparatuses necessary for e-library service at the highest level, establishing a network between the complex and scientific and technological knowledge dissemination rooms across the country and assigning scientists, experts and service workers. He underlined the need to successfully undertake the embankment project on Ssuk Islet where the complex is located and effectively arrange environment around it including afforestation and greening. He praised commanding officers and soldiers of KPA Unit 963 for contriving and introducing an innovative construction method and pushing ahead with the project in a bold way. He said every sector and unit should render sincere material and moral assistance to the construction of the complex so that it may be pushed forward as a project involving the entire Party, the whole country and all people. He was so kind as to solve all problems arising in the construction on the spot. That last sentence I found particularly humorous. Last year, the faculty residence for the Kim Chaek University of Technology was completed (two, 46-story apartment buildings) on the riverside of the Taedong River. 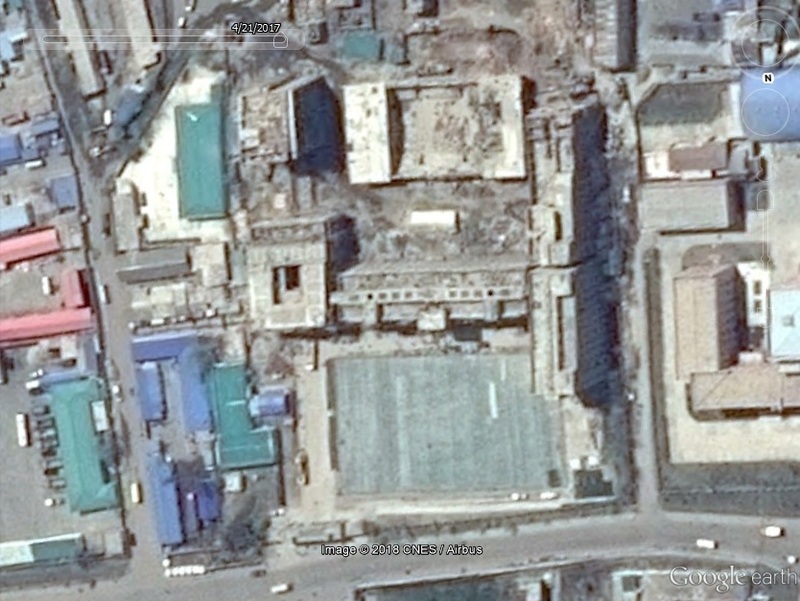 This high-rise, which looks afloat on the Taedong River, will be at the center of the currently-under-construction “Mirae [Future] Scientists Street.” This street will house various residential and public service buildings. This can be interpreted as one of North Korea’s efforts to revitalize the economy through science and technology. 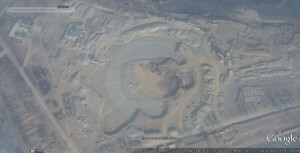 As shown in the satellite images above, construction on the new center had begun before Kim Jong-un made his visit. 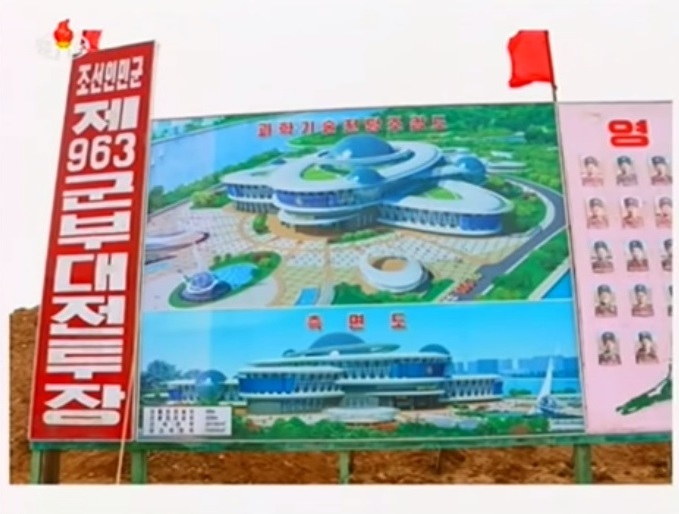 Saying that demand for the dissemination of science and technology is increasing as the day goes by, Kim Jong Un noted that the Party determined to build a modern scientific and technological study center on the islet to meet the requirements of the people. 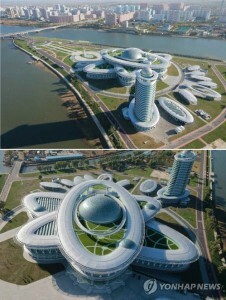 The center to be built on the islet will function not only as a comprehensive data base for scientific and technological achievements made by mankind but also as a multi-purpose scientific and technological service center, which makes it possible to use all data and share and exchange information through a network any time, he noted. He instructed officials to build the center at the highest level in the aspects of architectural beauty, formative art and architectural contents so that it may appear a building of national treasure and fashionable and world-class one. 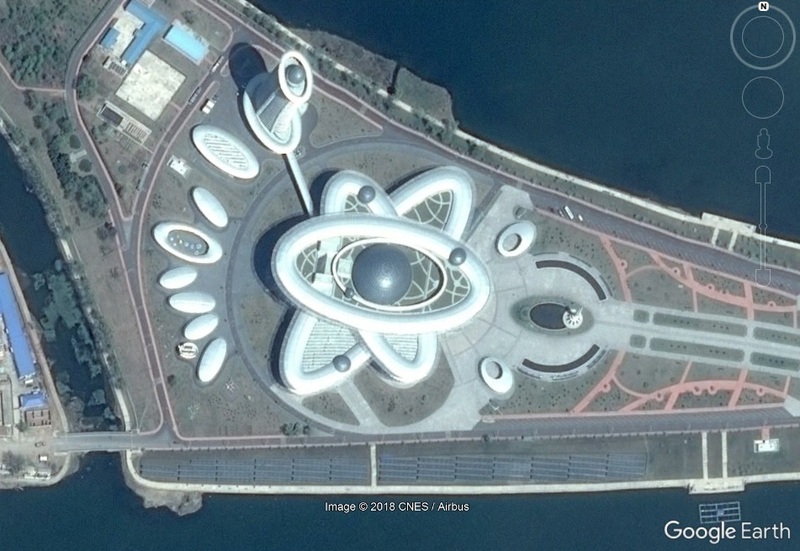 Feasting his eyes on both banks of the River Taedong, he said the site was a very good place and the center to be built on the islet would serve as another springboard from which the country would surpass the world’s level. He added he felt pleased to foresee the center. 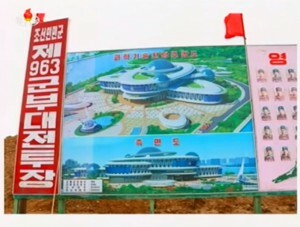 Noting that the scientific and technological study center to be built on the islet is another gift of the WPK for the people, he specified measures for designing, construction and the supply of building materials, etc.